Only the people who have a small kitchen understand the struggle of preparing a three-course meal in a small space. However, sometimes it’s not the size that’s the problem, it’s the design. So, here’s how you can improve the efficiency of your kitchen while keeping it trendy and chic. An open floor plan makes any space feel and look bigger, so if your home design allows it, open up your kitchen. This way you’ll create a much better flow from room to room and get an illusion of spaciousness. In order to visually separate your home, you can paint different areas of the apartment in different colours. For instance, paint your small kitchen a neutral white, but bring in some colour to your home by painting your living room walls bright. Light colours are known to open up even the smallest of spaces, especially if you combine them with plenty of natural light. You can use white paint for the walls or wall panels, create a light backsplash and paint your cabinets in a soft hue. While you can keep your walls neutral, you should consider adding a nice focal point to give some personality to the space. For instance, you can consider creating a backsplash full of colours that will draw attention, be practical and also serve as a beautiful piece of decor. Kitchens, especially small ones, often have the wrong lighting which makes them feel even smaller. 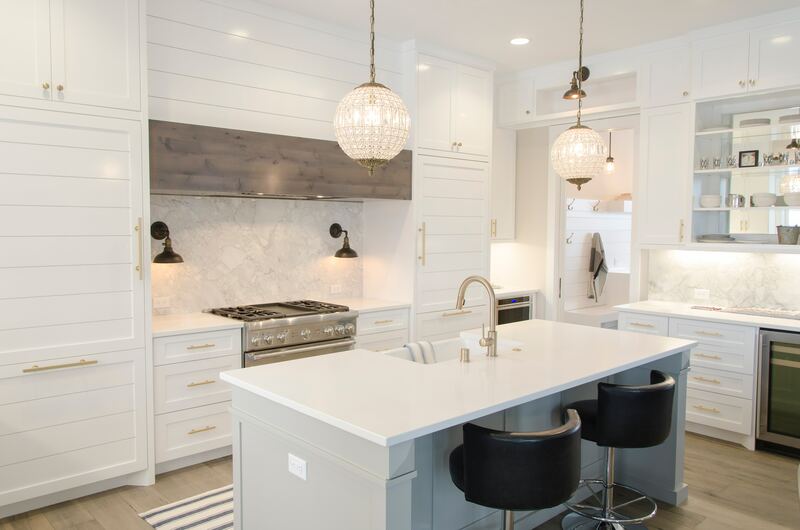 But, if you install a pendant light that hangs from the ceiling and put up some tape lights under the cabinets, you will not only provide ample lighting for general activities and food prep but also visually expand the space. Good lighting will automatically lift the mood and the tone of the space, which also affects the overall impression. Many people, when faced with clutter, tend to get more storage solutions, while a much easier option is to get rid of clutter. For instance, Australians usually love to cook, so they tend to buy many appliances and cooking gadgets they almost never use. If you’re just the same, check out your drawers and cabinets and get rid of everything you don’t use often. The rest of your items should be stored in the closed cabinets to achieve that clean and tidy look. This way, you’ll have much more space for a decorative piece or two. Also, make sure everything works perfectly. As soon as you notice some drips and leaks, you should call a plumber who will take care of your plumbing problems. Any kitchen should always be in top shape. Lastly, you need to make sure that water from the dishwasher and steam from all that cooking isn’t causing troubles with the design and health of a kitchen. So, to prevent any damages from happening you should research and find the right air purifier for mold and make sure your kitchen never has such problems. If you’re still struggling with storage, a great idea is to use pot racks. They can hang over the island, or be wall-mounted. They really save a lot of space in the cabinets and drawers, plus they look quite charming and chic as decoration. Furniture is usually bulky and takes a lot of space. However, there are a few tricks on how you can both have your cake and eat it. For instance, see-through plastic bar stools and mirrored cabinets take zero additional space and can even make a room seem larger. If your kitchen is located in the hall, but it’s so small that you can’t fit full-sized doors inside, folding doors will do the trick. They are quite practical, take very little space and can even serve as decoration. Clad them in interesting fabrics, or hang art you’ve always wanted to display but never had the space. Redesigning and decorating a small kitchen can be tricky, but if you follow these tips and tricks, your small space will soon feel like a kitchen fit for a master chef. Is Custom Building a New Trend in Real Estate?